As the first dusting of snow falls on sidewalks, peppermint candy perfumes the air and fireplaces warm homes, our thoughts turn to the holiday season. This is the time to get-together with friends and family, and to share the spirit of the season with our communities. 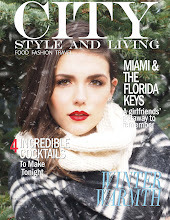 The holiday season is upon us and while the excitement rises, so too does the stress. One of the biggest challenges is finding the time to do all that is necessary to make a fun, festive and delicious holiday party. After work commitments, errands and household chores, how do we make the time to entertain? What if you could simply carve out one hour and prepare everything you need for the perfect holiday party? Bombay Sapphire calls it the Power Hour. With easy and quick batch recipes for both food and cocktails, one hour will be all you need to create a delicious, festive party. Best of all, the Power Hour makes your holiday party planning stress-free, giving you more time to enjoy your party. THE THEME Instead of going for colour or concepts as a theme, why not go with flavour. 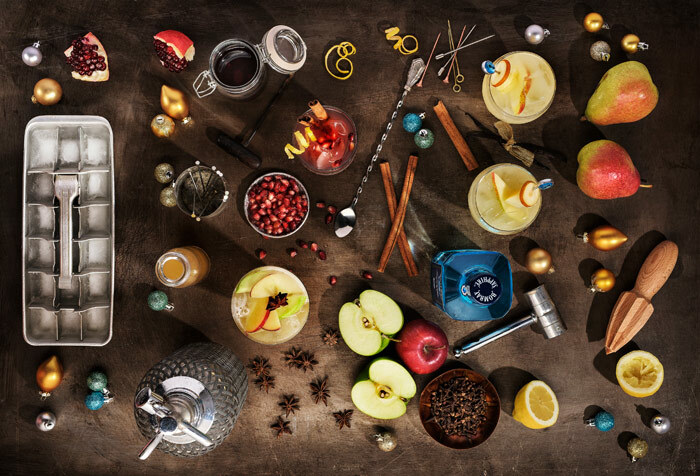 Bombay Sapphire is a great holiday spirit with a versatile and delicate balance of flavours, it makes the perfect choice for batched gin cocktails. 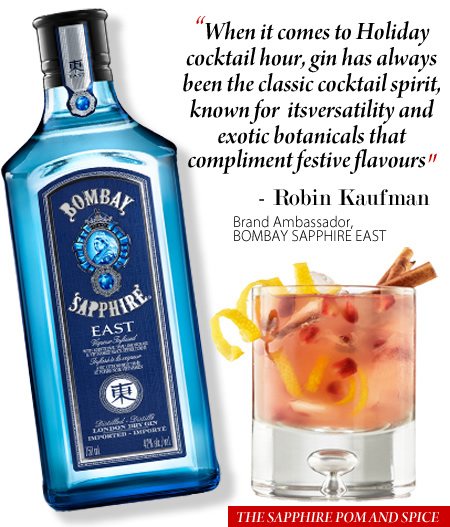 THE DRINKS Notable bartender, Robin Kaufman has teamed up with Bombay Sapphire to create three memorable, gourmet batch cocktail recipes that draw on the warm, spicy, festive flavours of the season. Regardless of your skill level, these batch cocktails are easy for home-bartenders to whip up in just a few simple steps. (One of our favourite recipes is below). THE FOOD Combining ready-made items with some made-from-scratch foods, not only makes hosting a gathering a time saver, but these small bites easily pair with batched gin cocktails. Lay out a cheese board, smoked salmon, and make simple canapés of avocado on toast points, or prosciutto wrapped figs. THE TIMELINE Organization is key to time saving - after mixing your batch gin cocktail set up your bar station with a cold bucket of ice, and extra garnishes like citrus wedges, pomegranate seeds and cinnamon sticks on a table so that guests can easily help themselves. Toast bread for canapés, and place cheese on a wooden board so it has time to breathe. Arrange seasoned nuts, mini meringues, chocolate truffles and olives in bowls. With thirty minutes to go, wrap dried figs with prosciutto and place on a platter, top toast points with freshly mashed avocado and grape tomatoes, and lay out the smoked salmon with dollops of sour cream and dill on a slate plate. ENJOY Bombay Sapphire helps you maximize your Power Hour by working in advance without the pressure of preparing dishes and drinks on the spot, and having to mix individual cocktails, so you can simply mix and mingle and enjoy your party. 1. Add all ingredients to saucepan at low to medium heat. 2. Bring to a very low simmer, but never boil for 10 minutes until sugar is dissolved. 4. Strain out spices, and bottle syrup. Keep refrigerated up to 3 weeks.